During its routine surveillance in Mbarara in March this year, the National Drug Authority (NDA) picked up about 48 vials of suspected falsified Hepatitis B vaccines from several health centres. The discovery triggered off a series of investigations in at least 18 drug outlets in western and central Uganda. Releasing the investigation findings yesterday, minister of Health Dr Jane Ruth Aceng said the falsified Hepatitis B vaccines were subjected to tests and found not to be harmful to the recipients. 2018-10-08 - Will Mulago’s new women hospital help or break the poor citizens? “Chemical tests done on both samples (authentic and false vaccines), did not find any harmful active pharmaceutical ingredient that would be injurious to the recipient. Additional field monitoring confirmed no adverse drug reaction,” Aceng said. Aceng said NDA has made efforts to monitor any side effects of the falsified vaccines, as well as the ones reported by the media, but so far none have been found. “NDA has made efforts to monitor side effects amongst those who received the falsified vaccines, but none have been reported and identified. Other events reported in the media were investigated by NDA and found not to be related to the vaccine,” Aceng said. Aceng also said that the potency levels in the false Hepatitis B vaccine had been reduced, meaning it might not have given effective immunisation. “Given the reduced potency levels observed in the falsified samples, the falsified vaccine may not have elicited the expected immune response that is protective against Hepatitis B infection for the individuals who received this vaccine,” she said. Aceng said the falsified vaccines had similarities with the government issued vaccines manufactured by the Serum Institute of India, prompting government to believe the vaccines were stolen and not manufactured. “Given the similarities we believe that the falsified Hepatitis B vaccine was government-issued vaccine and was most likely diverted or stolen for sales to private health facilities,” Aceng said. She said, among the differences in the vaccines was the labelling details, which had been deliberately altered. “There was however some variation in labelling and related details, such as batch numbers, expiry date, colour, and design schemes. There was also a deliberate attempt to erase the inscription of “Government of Uganda, not for sale, for public use only”,” she said. Aceng added that the lower potency in the falsified vaccines is most likely due to improper storage by the perpetrators, since no other similar vaccines had been coming in to the country. “Although the active ingredient and in-vitro potency test showed some differences between the two samples, with the suspect samples returning lower specifications, the difference could have been in poor cold-chain-management of the suspect samples during falsification. This is because NDA did not identify any inlet of that vaccine into the country,” Aceng said. Aceng said, cases of falsified vaccines are currently undergoing investigation, with one case already finished, which ended in a Shs 500,000 fine. “NDA continues to work with the Uganda Police, on eight cases which are at various stages of investigation and court hearing,” she said. The minister said that government is to suspend all private Hepatitis B vaccine camps, until they have been cleared. “The ministry of Health suspended vaccination camps for Hepatitis B by private health providers. All private medical camps seeking to offer Hepatitis B vaccination must be cleared by the ministry of Health,” Aceng said. She said, in order to improve the testing of vaccines, the NDA will advance the time on the construction of their own lab, as well as improve their presence on the borders. “To reduce the infiltration of poor-quality medicines and health care products on the market, NDA is fast-tracking the establishment of its state-of-the-art microbiology laboratory that will significantly increase the scope of testing,” she said. Social media platforms were on Saturday awash with reports that the MP, who last year moved an amendment to the Constitution to lift the presidential age limits had been poisoned and hospitalized. In a telephone interview with URN, MP Magyezi confirmed the he was in good health condemning the false reports about his life. "It is all untrue, they are just lies. I am fine, I have no problem. There is no poison. I have talked to police and Uganda Communications Commission (UCC) and they are trying to find out who started this, am sure they will be arrested," said Magyezi in part. He described the false messages as acts of criminality and a misuse of social media freedom. Earlier on in a brief statement parliament's principal information and education officer, Moses Bwalatum, urged the public to ignore what they described as 'false', social media reports indicating that MP Magyezi is unwell. "Today [Saturday] being visitation day, he spent it at Mary Hill high school in Mbarara where his daughter studies. He's now back at home to his family," reads a brief message sent by Bwalatum on Saturday night. Magyezi cited another Facebook message reportedly on Lands state minister Persis Namuganza page announcing his death. Magyezi says that the message indicates that some criminals have hacked into different social media pages with an aim of causing chaos and anxiety in the public. Magyezi, became popular late last year when he sponsored the private member's bill that was passed to remove the presidential age limit. The amendment was later this year upheld by the Constitutional court ruling that approved parliament's passing of the Constitutional (Amendment) No.2 Act of 2017. Magyezi's bill was seconded by Kyaka South MP Jackson Kafuuzi, Jinja West MP Moses Balyeku and Amolatar Woman MP Doreen Amule. Since his involvement in the 'age limit bill', Magyezi has on several occasions spoken out about threats on his life. In an earlier interview with URN after the Constitutional court ruling, the MP said that he still receives threatening messages on his phone. He, however, said that the court's decision to uphold his bill had taught him to continue standing firm by what he believes in. Magyezi says that some of the people who sent him threatening messages had since apologized while police is still carrying out investigations into different international telephone numbers sending him threats. KYOTERA. Hundreds of people are heading to Kasasa grounds in Kyotera Town Council, Kyotera District to celebrate 56 years of Uganda’s independence. Various guests including; ambassadors, ministers, religious leaders and Members of Parliament among others are already at the venue. A fleet of yellow buses started as early as 7am to collect people from various villages around Kyotera and Rakai Districts leading them to the venue. Many people are still lining up along streets in Kyotera Town, waiting for free transport service. Local musicians are keeping the audience entertained. Police have deployed heavily to secure the venue and its neighbourhoods. According to the Kyotera District Police Commander, Mr Musa Kayongo, all the routes leading to Kasasa grounds are well secured to ensure sanity during the celebrations. “We ask all our people to cooperate well with the officers because they are deployed to ensure their security," Mr Kayonga said. Several routes leading to the venue are decorated with Uganda flags. In Kyotera Town and Kasasa Township, business people are going about their usual businesses. Mr Moses Kiwanuka, a businessman in Kyotera Town says the prevailing poverty cannot allow him to take part in the independence celebrations. “Poverty is biting hard and we no longer have time for such events. If I close my shop and go to Kasasa, who feed my family? We left such celebrations to civil servants,” he says . 56 years ago, Uganda’s first executive Prime Minister Milton Obote set four-fold priorities for an independent Uganda: political stability, safeguarding the economy, improving social services and building an efficient civil service. That was at Kololo ceremonial grounds in Kampala on the night of October 9, 1962. This afternoon, President Museveni will, for the 33rd time, ascend the rostrum to speak to Ugandans as they observe the 56th anniversary of independence. 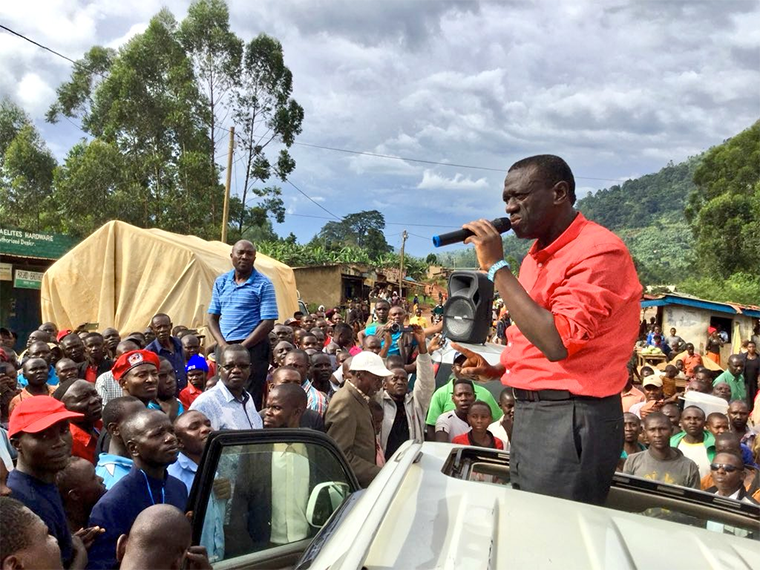 Tororo- Leaders of the Opposition Uganda People’s Congress in Tororo District Tuesday asked the ruling National Resistance Movement government to recognise their party for leading the country to independence under the leadership of the former president Milton Obote. Speaking during the 56th anniversary of independence celebrations at King George Memorial Stadium in Tororo, the leaders said the struggle to attain independence was not as easy as it’s considered by some Ugandans. The concerned leaders through the chairperson of the Women Council in the district, Ms Yedida Padde, appealed to the ruling government to be honest and give credit to UPC for its role in ending colonialism. She said it’s sad that the NRM government is busy giving out medals to “even cooks” but has never bothered to recognise those who fought for independence. ‘’It’s unfair for government to be seen awarding medals to even cooks leaving out historical leaders who fought for independence. Much as you are in power, records show that UPC led the country to independence and it should respected,’’ she said. ‘’All of us once belonged to UPC or DP and formed NRM. Therefore, it’s only a fool that will never remember where she or he came from,’’ Ms Padde said. The State Minister for Health, Ms Sarah Achieng Opendi commended the UPC leaders for raising their concerns saying the government has not forgotten about them.